After making department store and convenience store purchases a breeze using cashless payments, Globe announced that its mobile wallet payment platform GCash is now accepted at select Fruitas stores. Fruitas Holdings, Inc. (FHI), the leading group in the food cart industry in the Philippines, now accepts payments using the GCash scan-to-pay feature in its pilot stores in Metro Manila. This includes two Fruitas stalls, Johnn Lemon, and De Original Jamaican Pattie Shop and Juice Bar in Market! Market! Fiesta, Bonifacio Global City; Fruitas, De Original Jamaican Pattie and Juice Bar, and House of Fruitas in Metro Gaisano Market! Market! ; and Buko ni Fruitas and Johnn Lemon in Ayala Marikina. This means that with the help of the GCash app, customers may now purchase their favorite Fruitas beverage using the QR (Quick Response) codes present in Fruitas stores. By the end of 2018, Mynt, the mobile financial service company of Globe, is targeting to enable Fruitas Holdings Inc. to accept GCash payments in all its stores nationwide. GCash is the pioneer in electronic payments using QR codes. Aside from Fruitas, all other brands under Fruitas Holdings, Inc. will also start accepting the GCash Scan-to-Pay feature. This includes Juice Avenue, De Original Jamaican Pattie Shop and Juice Bar, Buko Loco, Fruitas Ice Candy, Black Pearl, Fruitas House of Desserts, Johnn Lemon, The Mango Farm, Jammin’ Jamaica, Shou La Mien Hand-Pulled Noodles, 7,107 Halo Halo Islands, Friends Fries, Buko ni Fruitas, Fancie, Cindy’s Candy Cloud, Tearex, Munifico Pizzeria, The Pub, and Cellar 150. GCash will also be available at Fruitas Holdings stores in Cascades Lifestyle Park, Le Village Lifestyle Park, and Uno Cinquenta Food Park (formerly 150 Maginhawa). “We recognize the need to adapt to trends; not only in introducing new offerings catering to the taste of Filipinos, but also in improving their total experience with our stores. Partnering with GCash allows our consumers to perform hassle-free mobile cashless transactions. 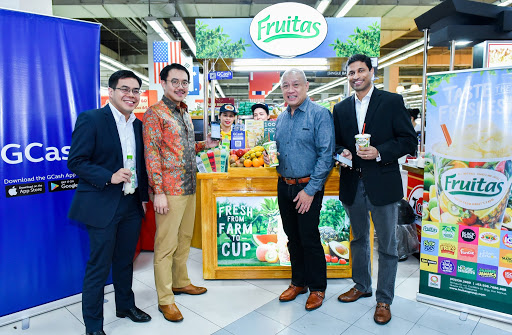 We are looking forward to scaling as we ride on the ecommerce wave,” says Lester Yu, founder and Chief Executive Officer of Fruitas Holdings, Inc.
FHI continues to cater to the needs of consumers as it finds new ways and fresh concepts to bring accessible and healthy products to Filipinos. Through this partnership, Fruitas Holdings is able to display how it adapts to trends by integrating the cashless payment scheme. “After SM Store and Mini Stop, it’s now the turn of Fruitas to experience what cashless payments using GCash can do to their brand. We’ve seen long lines of people queuing at Fruitas outlets just to enjoy their products. With GCash, we can definitely cut those long lines in order for more people to enjoy Fruitas (for) as fast and simple as a tap and scan on their phones. Using GCash means better business for Fruitas,” declares Anthony Thomas, chief executive officer of Mynt. “Cashless payment using mobile phones is still largely in its infancy stage in the Philippines but it’s getting to be more popular and soon will be widely accepted. We are glad to be at the forefront of this technology, which is all part of our objective of creating wonderful services for all our customers,” says Ernest Cu, president and Chief Executive Officer of Globe. Late last year, the GCash scan-to-pay feature became available at all SM Store outlets and at all Mini Stop convenience stores nationwide in order to promote cashless payments in the country. In order to purchase using GCash, customers with an iPhone or Android smartphone simply need to download or update to the latest version of the GCash app. Once the app is downloaded, customers only need to register an account and fund their GCash wallet by loading funds through any of the more than 12,000 GCash partner outlets nationwide.All the customers have to do is tap Scan QR and point their phone’s camera at the store partner’s QR code, to pay. As an introductory promo to GCash users, those who pay using the app will be able to enjoy 10% cash back in each of the nine pilot stores of Fruitas Holdings, per day. The promo lasts until March 31, 2018. GCash is operated by Mynt, the financial service company owned by Globe Telecom and Ant Financial Services Group, one of the world’s leading digital financial services providers, and Ayala Corporation. For more about Fruitas Holdings Inc, visit: http://fruitasholdings.com/. For more about Globe Telecom, visit www.globe.com.ph. The New Spicy Chicken McDo Is Here!